Researchers and companies release "treadmill desk" and "Walkstation"
(CNN) -- If you've ever embarked upon a exercise regime, you'll know that the benefits go much further than just physical fitness. 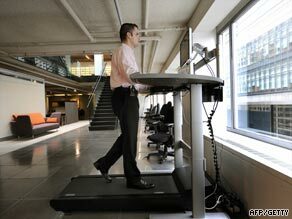 The "Walkstation" may soon let employees burn extra calories while replying to emails from the boss. It's well known that being fit can improve your mental health and confidence, and now new evidence shows that physical activity might even make people more productive in the workplace. A 2008 study by the University of Bristol, in England, found that people performed better at work on days when they exercised. Employees reported being more productive and feeling calmer on exercise days. "The study also begs the question whether employers can afford not to be encouraging active breaks," said Jo Coulson, research associate at the university's department of Exercise, Nutrition and Health Sciences. But many employers are already playing a role in keeping their workers fit and healthy. In Japan, employers are obliged to help keep their workforce trim. Under new regulations everyone over the age of 40 must have their waists measured annually. If a man's waist is more than 33.5 inches, or a woman's more than 35.5 inches, they are given advice on dieting and encouraged to lose weight. Businesses must make sure their oversized employees meet weight-loss targets, or face financial penalties. Employers in the U.S. are increasingly aware that employees who exercise cost them less in health insurance. As a result employer "wellness programs" have become widespread among American businesses. From miserable man to 'Ultraman': A fitness journey. Almost a third of U.S. companies offering health insurance benefits to their employees also provide a wellness program of some sort, according to 2006 employer health benefits survey by the Kaiser Family Foundation. IBM says it has spent more than $130 million on wellness since 2004. Megan Benedict, U.S. wellness manager of IBM integrated health services, told CNN that while the company has operated a wellness program since the 1970s, the addition of financial incentives in 2001 has been the key to encouraging employee participation. IBM offers employees up to two $150 rebates a year if they meet health targets, which include exercising for thirty minutes at least three days a week or taking part in a nutrition and weight management option. There's even a rebate for taking part in a program to help employees' children lead healthy lifestyles and maintain a healthy weight. The payouts seem to have paid off for IBM. Between 2003 and 2005 wellness program participants' health care costs increased by $291 a year, compared with a $360 increase for non participants. "Before the cash incentive only about 10,000 of our 120,000 employees took part and now over 90 per cent of our employees participate in the program," said Benedict. "We've seen health-risk reduction and lower healthcare costs for individuals who participate. It makes sense for the company because we're saving in healthcare costs." Keeping workers in shape needn't involve financial incentives. Google's Zurich offices include features like a gym, pool tables, a slide leading to the canteen and fireman poles between floors. Mark Detre works in internal communications for Google and was based at the Zurich offices for eight months. He told CNN that having a gym open all day in the heart of the office is a huge incentive to keep fit. In addition to the gym the building is designed so that employees are forced to walk around to get to meetings. It's a feature primarily to encourage worker interaction, but in a building the size of Google's offices, it keeps employees mobile. Detre believes all that movement is good for the company. "If you can get away from your desk and not look at your screen you come back refreshed, which makes you more productive," he said. If a lunch-hour gym workout sounds like too much effort, some employers have found more sedate ways to incorporate exercise at work. Lunch-hour yoga classes are widespread and tai chi, a leisurely martial art and traditional pre-work exercise in China, is finding its way into the unlikeliest of places. The Scotsman newspaper reported that Scottish fishermen who were introduced to Tai Chi by an occupational nurse had fewer back problems and lost fewer days to sickness or injury. A study published in The Spine Journal last month showed that exercise is effective in reducing back pain -- an ailment estimated to cost countries like the UK and the U.S. billions of dollars in lost productivity every year. Exercising at work is one thing, exercising while you work is another. Researchers at the Mayo Clinic in Minnesota developed the "treadmill desk" in 2005, a workstation fixed to a gym-style treadmill that lets office employees walk while they work. U.S. company Steelcase now manufactures its own commercially available "Walkstation," and while it's no substitute for a session in the gym, you may soon be able to burn extra calories while you reply to emails from the boss.